Over two days explore Kangaroo Island, one of Australia’s finest nature based destinations, in the comfort of a modern touring coach. Experience the wildlife, spectacular coastal scenery and unique landscape. Take the time to explore Kangaroo Island, one of Australia’s best nature-based tourism destinations and one of Australia’s national landscapes. This relaxed yet comprehensive two day tour allows you to discover Kangaroo Island’s fascinating wildlife, spectacular coastal scenery, stunning landscapes and unique local produce. The 2-day tour departs daily from Adelaide, Goolwa and Victor Harbor, Cape Jervis and from Kangaroo Island if you are already staying there. We’ll pick you up and return you to your Adelaide accommodation, or you can choose to board at the Adelaide Central Bus Station. 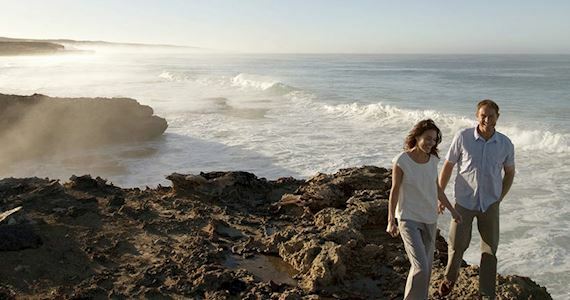 An early morning pick up from your hotel for a scenic coach journey to Cape Jervis taking in the picturesque Fleurieu Peninsula with its vineyards, coastal views and rolling hills. On arrival, board the SeaLink ferry for the 45 minute crossing to Penneshaw on Kangaroo Island. Here you will board your luxury SeaLink coach and your local driver/guide will take you on a tour of South Australia’s premier nature-based tourism destination. Your first official stop will be at Emu Ridge Eucalyptus Distillery, an interesting bush engineered eucalyptus distillery that makes the most of its environmental resources. After testing and tasting the eucalyptus products, travel to Vivonne Bay Bistro, located on a 260 hectare bush property, for a delicious two course lunch. After lunch visit Seal Bay Conservation Park and enjoy a guided beach walk with a National Park Ranger amongst a breeding colony of wild and rare Australian Sea-lions. Your tour will then visit another amazing wildlife attraction, the fascinating In-Flight Birds of Prey display, an interactive and educational display of native Australian birds and raptors. Finish the day at the Kangaroo Island Wildlife Park where you can feed kangaroos, have your photograph taken with a koala, and enjoy a guided tour of the park, before being transferred to your choice of overnight accommodation. After your morning hotel pick up, your second day of touring begins at Clifford’s Honey Farm with an informative talk by the beekeeper followed by tastings and an opportunity to sample homemade honey ice-cream and honey beauty products. Next, travel to Hanson Bay Visitor Centre and Cafe where you will enjoy a delicious two course lunch. After lunch there is time to look for koalas nestled up in the eucalypts, before continuing on to the western most part of the Island, Flinders Chase National Park. Travel through the park and learn about its unique trees and plants. See the rugged southern coastline, and enjoy a walk around Remarkable Rocks, providing spectacular photographic opportunities, before continuing on to Admirals Arch, where the boardwalk takes you down a rugged cliff face to reveal this spectacular arch, a natural nursery and safe haven for playful Long-nosed Fur Seals that can be seen swimming and playing in the waves, or resting on the rocks. There is a possibility you will see more wildlife on your journey back to Penneshaw, where you will join the ferry and coach for your return transfer to Adelaide.